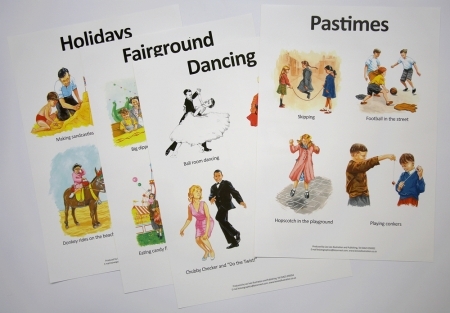 The Pastimes poster set features colourful images from childhood games, holiday fun at the seaside and fairground to dance floor styles and fashions. They will evoke happy childhood memories of playtime games and hobbies, television shows, teenage pursuits and entertainment and sporting personalities from the 1940s to the 1970s. The fully laminated posters will make a colourful addition to care home memory lanes and quiz activities.